More Thomas Bernhard. Thanks be given to Douglas Robertson for completing this Liebe zur Sache. Thomas Bernhard. Yes, I know. Forgive me for returning to this writer like a dog to somebody else's vomit. Specialisation has been described as knowing more and more about less and less, which seems correct given the proliferation of English translations of Thomas Bernhard in recent years, and especially these letters, as they reveal only how far removed this writer is from the comforts of Sunday supplement profile chumminess. No matter how many letters he writes, he never resolves into anything clearer or warmer than a brick wall, and still we want to peek over. As readers, we are like Bernhard himself because, as Siegfried Unseld says of his play Ritter, Dene, Voss, it is really a play about Wittgenstein: "the genius Bernhard is simply possessed by this genius, in the sense of being attracted and repelled by him". But I'm happy to read more and more Thomas Bernhard and happy to understand less and less. 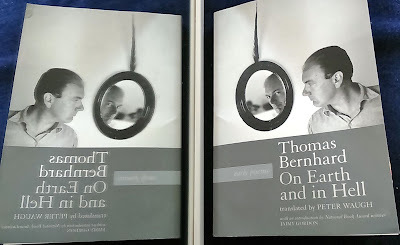 It is in reading Thomas Bernhard that Thomas Bernhard becomes Thomas Bernhard, though the poetry isn't very Thomas Bernhard. In reading we open up if not another world then at least the possibility of breathing and speaking, perhaps even breathing and speaking In den Flüssen nördlich der Zukunft in Paul Celan's words (In the rivers north of the future). This might explain why, when Peter Handke complains that "because the things [Bernhard] writes don’t tackle problems of narrative or form at all, they seem to me to be having an almost detrimental effect on art," he has nevertheless "revered him for 25 years as a kind of secular Austrian saint". Perhaps this peculiar ambivalence is linked to that quality of sainthood and is fundamental to the inexplicable character of Thomas Bernhard, and that his personality is inseparable from the nature of his writing – the only thing that still supports me – much as a saint becomes his goodness, an aura without centre, a blank where the person used to be. This is a rare thing in a modern author, used as are we to those Sunday supplement profiles. It is fitting then that, in the final installment of the private correspondence between Bernhard and his publisher, this dynamic of attraction and repulsion continues. Fitting but frustrating. In the first letter from January 1986 Bernhard is repellent when he calls Marianne Fritz's newly published novel Dessen Sprache du nicht verstehst "addlebrained proletarian rubbish," but more appealing in his self-pity: "The cuff to my ears that you have administered via the publication of these dubious 3,000 pages is having a profound effect". What profundity this is exactly, he doesn't say, but this is typical. "In questions of so-called high art, I am not someone you want to joke around with". That so-called is also typical, claiming expertise in a grand subject and then stepping aside to begin and end a coy dance. Rather than furthering our understanding, this is the dance that relieves us of "the problems of narrative or form" and, once again, we are like Thomas Bernhard in regard of such concerns. As Unseld tells Handke: "Thomas Bernhard has enough trouble dealing with himself and the world around him". For me, the most notable part of this final exchange, and the only reason I began to write this, is when Unseld reports an unpublished Bernhard novel called Neufundland. I'd heard of it before, in a BBC Radio documentary fifteen years ago, except there it was said the novel consisted of two pages, with one sentence on the first page about two people, one a doctor, going up to a house on a mountain, and the second sentence on the second page: "… and died at the age of fifty-nine in Newfoundland". Yet, in February 1987, Bernhard tells Unseld that the novel is finished and is "about the same length as Woodcutters," and in November 1988, three months before his death, he reaffirms its existence. So what happened? Might there be a manuscript hidden somewhere, or did Bernhard lie about having finished it? Most likely, I suppose, unhappy with the work and finally exhausted, he destroyed the manuscript (often a promising move I like to think). What ever the truth, the question of the existence of Neufundland survives its impossibility and its fractional presence allows one more dance with Thomas Bernhard, in its way a gift as immaculate as Extinction. We assume the novel exists in a physical form, the wad of paper in our hands, but in our mind each book as a whole is only an opaque kernel, the combination of a title, an impression, a feeling, an idea, a vision borne only in a style, a tone of voice, one that stirs us to exclaim and to reassert its existence by reading once again. In this case, we have only the title and a kernel so opaque that it is transparent. Warm thanks for your appreciative words at the beginning, Stephen. Regarding Neufundland: your conjecture that Bernhard destroyed most of a complete manuscript ultimately seems the most plausible one. (He certainly had no motive to pretend it existed if it didn’t.) The editors of the correspondence write of a “few” (not two) pages’ survival, so perhaps slightly more of it is left than the makers of the documentary thought. At any rate, the book Thomas Bernhard und seine Lebensmenschen reproduces two pages that seem to be the ones you mention. They are in very rough draft, with numerous out-crossings and additions. If I can get them to scan (the book is impossible to lay flat), I will post them on Google+. Hi Douglas, I hope you can scan the book or, if you have an adequate camera, take a snap. Handke is not exactly the kind of nature writer currently fashionable in the UK with their Heaneyesque lyricism, but you only have to read the first line of Der Chinese des Schmerzes to recognise the importance of spaces and landscapes to his work, particularly the self's relation to them. There are also the famous passages about the Karst region in Die Wiederholung and Mont Sainte-Victoire in Slow Homecoming.